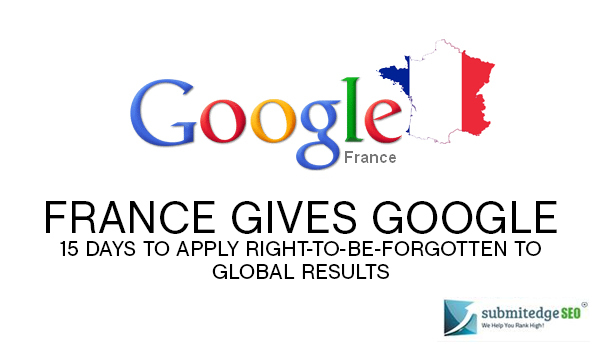 France Imposes RTBF on Google Global Results-Right or Wrong? The Right to Be Forgotten is indeed an ambiguous phenomenon. If you are aware, its ruling came into existence in the year 2014 wherein many debatable issues related to its legitimacy came up. To explain the simplest paradox, if a person has the right to be forgotten, people also have a right to find them. EU perhaps has to be reminded of this paradox while it attempts at capturing the whole of Google with respect to censorship. Their request for RTBF extends to not just the whole of Europe but practically the entire world in terms of internet access. This is definitely a cause for concern, because what EU demands is the right to monitor control over Google search engine results in general as opposed to specific juridical access. In the light of the issue, you must remember that there is still no definite clause to this motion. That is, whether Google brings RTBF into effect with respect to just the keyword as the title or a part of the title is not known. So even when France increases the pressure on Google to implement this on a global scale, the effect could be keyword specific, or not. While the idea of effective de-listing in isolation is understood, contextually it makes no sense. As of now Google has de-indexed content only from the European domains. In order to rule out objectionable content across domains worldwide would be a massive step in the data protection arena. Google seems to be doing a sensible job here. Statistically equipped with accurate information, it explains how EU restricted censorship is just as effective. It says that the search results from EU domains account for only 5% on Google, which obviously explains the pointlessness of the removal requests on a global scale. Google has already acceded to numerous requests since 2014. Till date, stats display about 40% of accepted and implemented requests of the total number they received from EU domains. What gives the CNIL or any other European privacy regulator the right to control data protection is beyond the search engine’s comprehension. While striking a positive balance between privacy protection and right to data access is attempted here, its implementation is a slip from legitimate ruling as it is unfair from a global viewpoint. After all, no power economy would want China to determine how the world should think of Tiananmen Square massacre, would it? Unfortunately, the CNIL is pretty aggressive about the whole issue. If the motion is not implemented within the next fifteen days, CNIL would slap a fine of €150,000. In all fairness, Google is free to oppose the sanction and move against CNIL in court. In any case, the rule is effective only with respect to search engine results. Users publishing content need not in any way modify whatever they feature online. If anything, the indexing displayed in the global search engine results will change, if this motion ever becomes a worldwide practice. From the SEO perspective, this is definitely something to worry about.